5G has come a long way since that survey was conducted a little more than a year ago, and its impact will dramatically shape the future. In late 2017, Ericsson released the results from a survey of 1,000 C-level executives across 10 industries. Among the findings, 62 per cent of respondents said that one big obstacle to 5G adoption was that it was “too soon to know what the real benefits will be.” It was a valid point. The technology was in its infancy and there was a great deal of hype and confusion in the market. The reality is, the industry itself was trying to determine what could be done with this next generation of cellular mobile communications. In 2019, we will actually see a wide range of 5G use cases in action. Commercial 5G networks are now going live. And while previous generations of wireless connectivity were focused on consumer and personal communications, 5G will also serve enterprises, in large part by taking the internet of things (IoT) to the next level, where fast and smart connectivity is a prerequisite. Initially, 5G will be a capacity enhancer in metro areas, with enhanced mobile broadband and fixed wireless access so operators can address explosive traffic growth. Every generation has brought with it lower latency and greater cost efficiency. However, 5G takes things much further with traits that make it unique. It features tremendous bandwidth, resulting in huge pipes that deliver super speeds. But just as important, 5G is not just a communications network; it’s an intelligent connectivity platform that can be harnessed by a range of industries. Yes, 5G has come a long way since that survey was conducted a little more than a year ago, and its impact will dramatically shape the future. In technology, the rubber hits the road when standards are settled. That’s when all the players begin speaking the same language, interoperability is considered and sophistication grows with each new development. While 5G has been discussed for a number of years, the 3rd Generation Partnership Project (3GPP), a collaboration between groups of telecommunications associations, didn’t formalise standards until the end of December 2017. Prior to that, various vendors and telecom service providers conducted pilots and trials, but these were based on various flavours of enhancements to 4G. This is likely what caused confusion. Without a set of standards to govern the industry, different groups were doing different things. There was no continuity even in definitions. With the ratification of 5G non-standalone standards, everyone is now working on the same set of technology. Nevertheless, 5G has evolved in much the same way as other mobile technologies, which means there’s some overlap with previous versions. For example, when LTE was introduced around a decade ago, there wasn’t a cutover date when providers shut down 3G and rolled out 4G. That is just not the way this technology evolves — instead, it comes in waves. In the initial deployment phases, 5G will be a non-standalone technology. This means it will rely on and leverage existing 4G LTE networks, which are very progressive and ubiquitous. When you hear providers say they will launch 5G this year, essentially, they’ll be leveraging existing networks, which can be easily done through software upgrades. The U.S. was first with live 5G networks, but 5G has also been deployed in operational networks based on commercial equipment in Europe, Australia and Asia. Ericsson has announced 5G contracts with 13 named service providers. We also have 40 operator memorandums of understanding worldwide. This was part of the first 5G development wave. This year, we’ll begin to see the first wave of commercialised 5G networks. The tier-one operators that are launching 5G this year will likely be the first to offer pure standalone 5G networks in 2020. The attributes of 5G are impressive: high data rates, low latency, reduced energy use and cost savings. 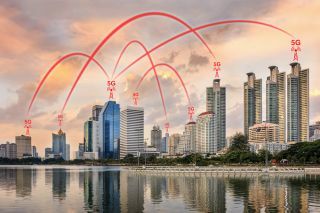 These alone are great advancements, but what really sets 5G apart is its ability to act as an intelligent connectivity platform, which ultimately provides system capacity and massive device connectivity. In the very near future, 5G will enable many new products and services that otherwise wouldn’t be feasible. For consumers, 5G can support the entire smart home with its slew of connected products, enhanced with videos and augmented reality. But it’s in the commercial realm where 5G really shines, where it will enable new use cases associated with “Industry 4.0,” and, most notably, IoT. The IoT market has historically been divided into two segments, massive IoT and critical IoT. Massive means there are a lot of devices, but they may not require critical, super high-speed communications. For instance, there are millions of meters in service for tracking electricity and water usage, but each meter requires very little bandwidth. There’s no constant signalling between those devices and the data centre; these devices can send data every 30 to 60 minutes in batches. There’s nothing new here; there’s just more volume, and 5G has the capacity to handle it. Critical IoT, on the other hand, requires 5G, because it needs connectivity to be super-fast and extremely reliable. These applications, which could include autonomous vehicles or real-time control of remote operations, cannot tolerate latency. With 5G becoming a commercial reality around the world, we see the emergence of two additional segments; broadband IoT and industrial automation IoT. Broadband IoT provides much higher data rates and lower latencies than massive IoT, while utilising functionalities specific to machine type communications to extend coverage and device battery life. This segment targets a wide range of growing use cases in automotive, drones, augmented and virtual reality (AR/VR) devices, and advanced wearables. Industrial automation IoT covers solutions primarily for the manufacturing sector. These have extremely demanding connectivity requirements and need very accurate indoor positioning, distinct architecture and security attributes. Industrial automation IoT, which could use private cellular networks, is the key enabler for the full digitalisation of Industry 4.0 for the world’s manufacturers. The advent of 5G will also transform the business models of telecom providers and enterprises alike. Telecom providers will evolve to take roles higher up the value chain beyond connectivity: to help enterprises manage the entire lifecycle of connected devices and the growing amount of data generated by these devices, for example. Enterprises, meanwhile, will find 5G opening new doors to product and service innovation, leading to new customer segments and revenue streams. 5G is about to come into its own. Developments will be fast out of the gate, but there will be ongoing developments as it evolves. The 5G evolution continues, but make no mistake, there is a revolution coming.